I dove right into the fabric I ordered for the Rockabilly Baby Quilt, and I am excited to share the finished flimsy with you today! I based the design inspiration for the quilt on several ads that I found online. The circle marque, wonky rectangles, and sets of offset lines that are in the quilt top were all pulled and based on the graphic art I found in these inspiration images. In order to pull off the circle marque look that I was hoping for, I created a template and sewed the circles into the background fabric as one piece. And having struggled with applique puckering in the past, I called my mom (who is also a quilter) on Sunday afternoon to pick her brain about the stitch to use for applique. I usually try a zig-zag stitch, and she suggested I use a blanket stitch instead. I even made sure I knew which side of the fabric each edge of the blanket stitch should be catching, and I enjoyed the best success with applique I have ever had! Thanks, mom! The quilt top finishes out at 60 1/2-inches wide by 70-inches long. 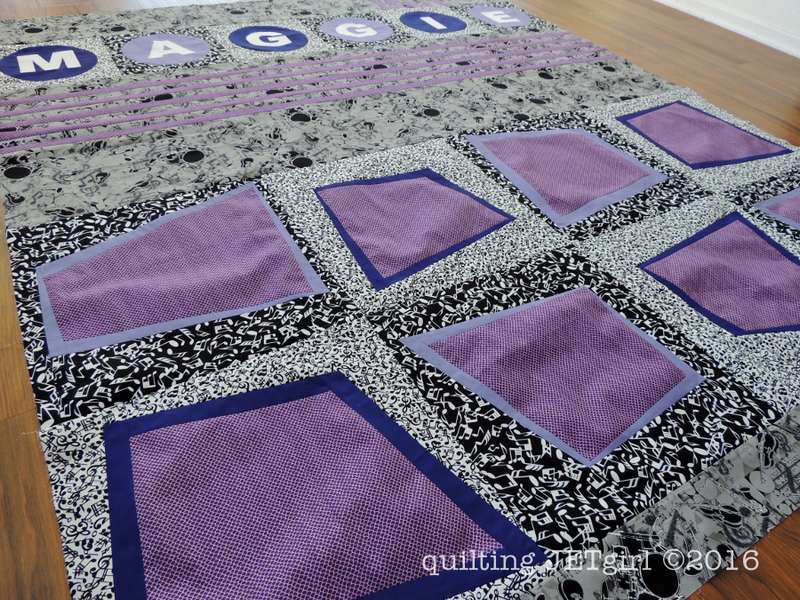 I expect to get to start quilting this fun quilt today or tomorrow, and I will be using some of the purple Aurifil thread I picked up just before Christmas. Linking up with Let’s Bee Social and WIP Wednesday to see what everyone else is working on this week. It does have a real graphic feel, very similar to your ads, you pulled it off perfectly. Hope your friend/client loves it too. What a great idea! I’m crazy for ‘all things letters’, so love this! I agree with Sally, I think you pulled this one off perfectly! I’ve only done applique once, and used the blanket stitch. Yours looks fabulous! Congrats on getting this one done so quickly! Looks great! I like how you captured the spirit of rockabilly, and am a huge fan of the offset lines. Looks like you’ll have a lot of space to play around with for the quilting! Very cool design, and I love how you showed your inspiration images. The horizontal lines remind me of a musical staff or guitar strings. Great job creating a unique and personal quilt! That’s what those circles were for! I cannot believe you sewed them into the background! You nailed the vibe completely! This little girl is going to rock the world! Thanks for sharing your inspiration photos, it makes it even better! That is too cool! Love the 40’s and 50’s vibes–modern retro! You rock!!! This is quite possibly the coolest baby blanket I have seen. Your designs always amaze me. You could not have come up with anything more perfect for them. You can really see the elements that you pulled from your inspiration photos. Those wonky rectangles in the first ad just jumped right out at me. 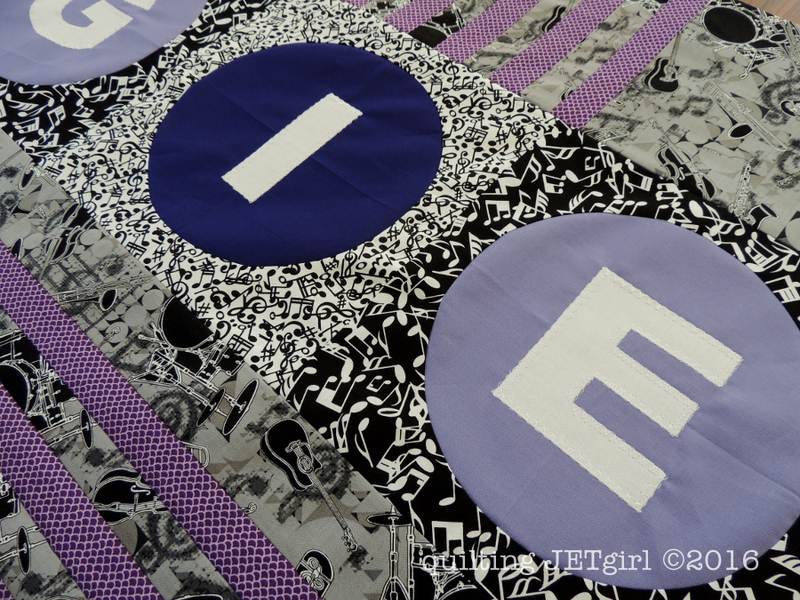 Glad you had some successful appliquéing – circles especially can be tricky. Yvonne, I think that this is an amazing quilt! The design is brilliant and just works splendidly with the fabrics. In applique, like you, I usually use the zigzag stitch but the blanket stitch is chosen by many quilters as their go to. So glad that it worked for you. It is always fun to try out the stitches on the machine that we do not use very often, I have even chosen a couple of the stitches as quilting stitches and they worked perfectly. Looking forward to seeing the fabulous quilting designs that you chose for this quilt…have a fantastic creative day! very cool, I love the mix of shapes and the applique looks wonderful!!! Love the quilt design. The great thing about it is it will be great for when Maggie is older too, especially in those colours. Love it. What a neat design Yvonne! I struggle with appliques too and it really looks like your mom’s sweet advice paid off, the letters look great. This is a neat quilt, I use the blanket stitch the most when appliqueing. I think this design is perfect and you did a wonderful job on the quilt! I would love to know more about how you sewed those circles, they look really cool. Your appliqué looks so good! Wow! This is a great design. Didn’t see that coming. Good luck with quilting — can’t wait to see it finished. Cant wait to see the quilting! You really outdid yourself with this design Yvonne! It is a stellar representation of your inspiration posters! this is a fantastic graphic quilt! Your customer will be pleased 🙂 I await your quilting….this could be embellished in so many ways…..
Fun! I love the lettering. These are really cute. I love the design of this quilt, it really captures the feel of your inspiration images.